The Creative Writing Major at Washington State University brings students together in the study of writing poetry, fiction, creative non-fiction, and multimedia storytelling, and prepares them as well for careers in editing and publishing. Our faculty members, all well published working writers and scholars, nurture young writers from beginning-level craft classes on to advanced workshops. Our curriculum also engages students in the study of literature as they pursue their writing. Finally, we offer a certificate in professional editing and two extracurricular programs to expose students to the professional publishing world. These include our campus fine arts journal, LandEscapes—which students edit, publish and market—and our Visiting Writer Series that brings major literary figures to campus for presentations and workshops. 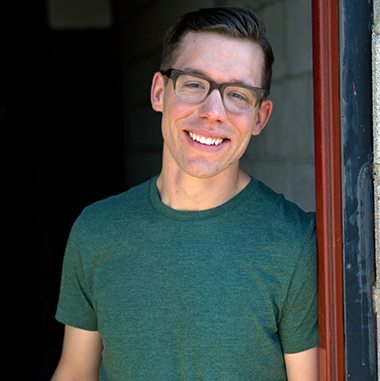 The WSU Visiting Writer Series brings to campus nationally and internationally renown poets and writers of fiction and nonfiction for readings, class visits, workshops, and collaborative exchanges across intellectual and artistic disciplines. The series is in its third decade and has supported visits by the poets Rick Bass, Robert Wrigley, Brenda Hillman, Galway Kinnell, Cecil Giscombe, Kathleen Flenniken, and Anne Waldman, among many others, as well as the fiction writers Kim Barnes, David Gates, Kevin Canty, and David Huddle, and nonfiction writers like William Cronin, Rolf Potts, Dinah Lenney, W. Scott Olsen, Robert Michael Pyle, and Marcia Parlow, managing editor of New England Review. The series also sponsors an annual editing and publishing workshop as part of our professional editing certificate. Working on LandEscapes is a whirlwind of deadlines, interviews, making mistakes and learning from them, meeting with writers and fundraisers. LandEscapes is the product of 15-18 people, including editors, marketing people, production designers, not to mention the many artists and creators we work with. We put out two issues a year, a digital version in the fall (starting Fall 2015) and a full print and digital edition in the spring, showcasing the full spectrum of student work in the arts–literature, the fine arts, and music. 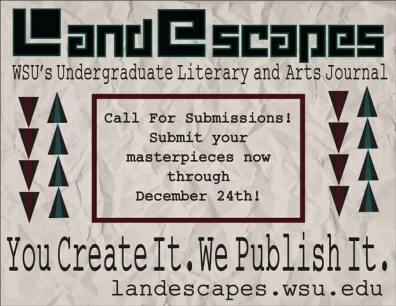 LandEscapes provides a unique opportunity for students to work at a professional publication on both sides of the industry–the business side and the artistic side–and strives to uphold and spotlight the creative excellence that Washington State University has to offer. For more information contact faculty adviser, Peter Chilson:pchilson@wsu.edu Phone: 509-335-7309. English Club at WSU seeks to provide a safe and honest place for writers from all backgrounds to share their writing and meet other writers. Contact Donna Potts at donnal.potts@gmail.com for more information.